For all mushroom lovers, and vegetarians this is another fantastic spicy Indo Chinese recipe Mushroom Manchurian. Here i have posted is a Gravy version of Manchurian. 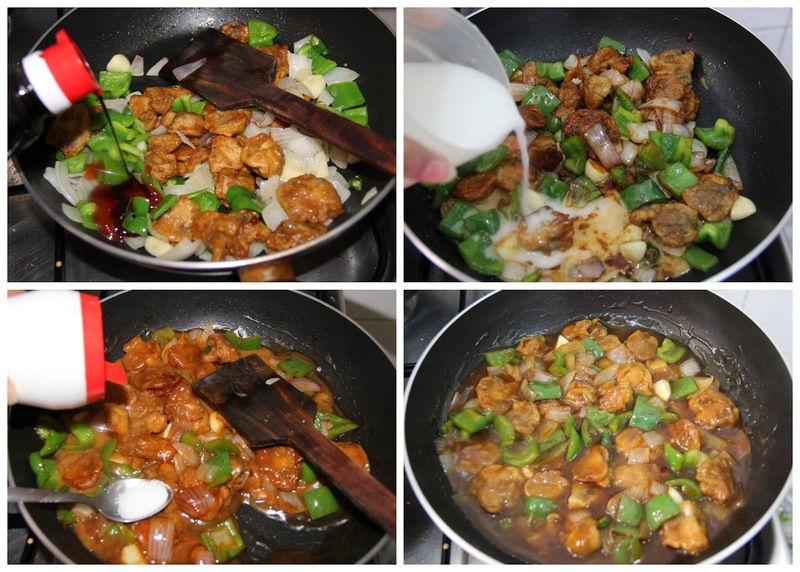 When I post the babycorn Manchurian many people asked me about how to prepare Manchurian Gravy. So I decided to post a recipe with gravy. I love the mild sweetness and juiciness of the fried mushroom in the gravy while eating. The taste explodes from the fried mushroom while eating. That is a wonderful experience in this mushroom munchurian. Often grouped with vegetables, mushrooms provide many of the nutritional attributes of produce, as well as attributes more commonly found in meat, beans or grains. 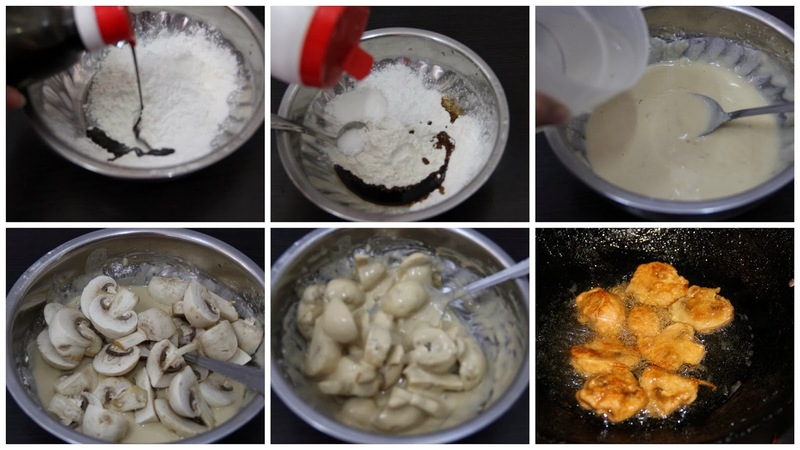 Mushrooms are low in calories, fat-free, cholesterol-free and very low in sodium, yet they provide important nutrients, including selenium, potassium, riboflavin, niacin, vitamin D.
Keep the mushroom pieces and dip well into the batter and deep fry till slight golden colour. 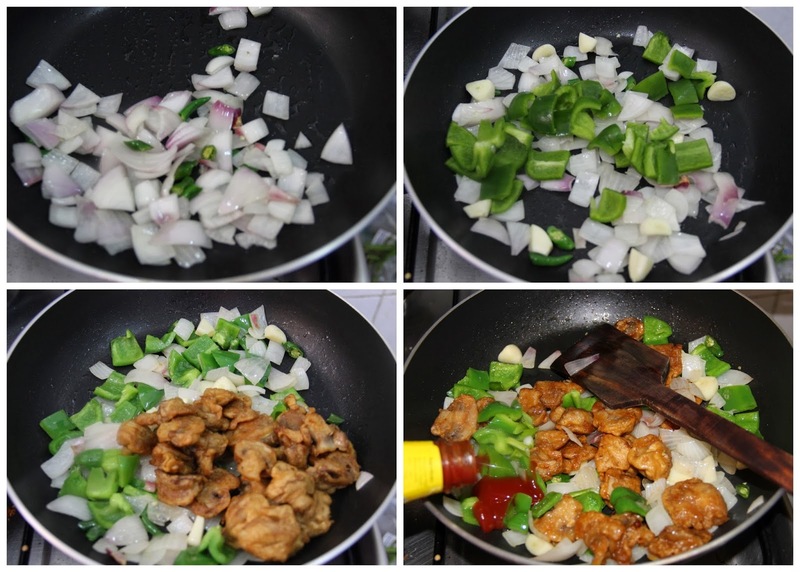 In a pan add oil and add onion, garlic and green chillies and half cook them. Then add capsicum and spring onion and cook but not the green colour of the capsicum doesn’t leave. Add tomato sauce, soya sauce, salt and sugar to balance the taste. At last add the corn flour slurry (dissolve corn flour in a cup of water) and allow the gravy to become thick. add salt and sugar to balance the taste. If you want more gravy add little more water and season with pepper. Garnish with chopped Spring onion. Lincy,your Manchurian looks so yummy and inviting me to try it. Very tempting clicks and mouthwatering too. Looks super good! 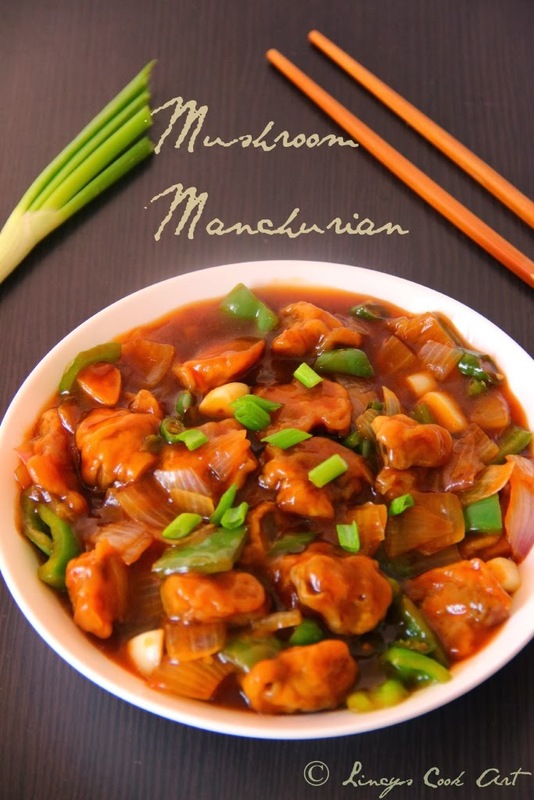 !I love mushroom and manchurian is a good way to go. Drooling over here, mouth watery and super tempting manchurian recipe. Such a delectable manchurian..Love this any time. I love indo chinese flavours this looks delicious. This looks just like the manchurians from the restaurant!